Albion and our partner, the National Museum of Slovenia, will be unveiling a recreation of Sword N4516, which we will be calling "The Ljubljana" ( a pronunciation guide can be found here: http://www.merriam-webster.com/cgi-bin/audio....jubljana), at a new exhibit on arms and armour opening at the Museum on December 12, 2012 - "Knight, Lady and the Dragon". Peter has exhaustively documented this masterpiece of the swordsmithing art and we have pulled out all of the stops to recreate this sword in time for the exhibit, where it will be displayed along with the original. Joe Waites and Eric Meulemans outdid themselves on this one, not only getting the two swords completed on time to ship to the Museum, but also in the quality of work they did in meeting Peter's specifications so exactly. We will be putting up a page on the Albion site, with more information from Peter and the Museum over the next few weeks. 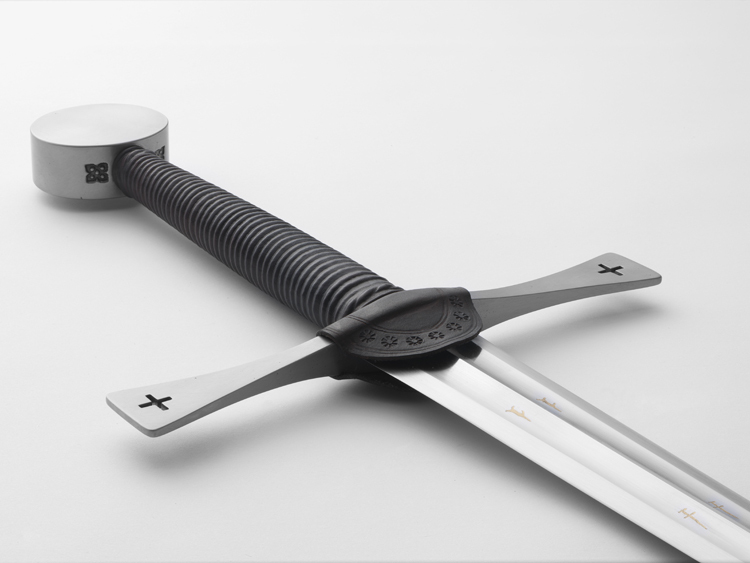 The sword will go into regular production early next year, but copies can be reserved now at a special introductory price of $2,800. This is a beautiful sword, with subtle and yet elegant lines and features. I can imagine from the hollow grind seen on the original blade that this must be a very lively sword in hand. Looks like another winner from Albion and Peter Johnsson. Absolutely beautiful. One of the Facebook pics shows the inlay recreated. Will this be a feature of the production version? Now THAT is a gorgeous sword! Well done Peter and Albion. The level of detail is really impressive. 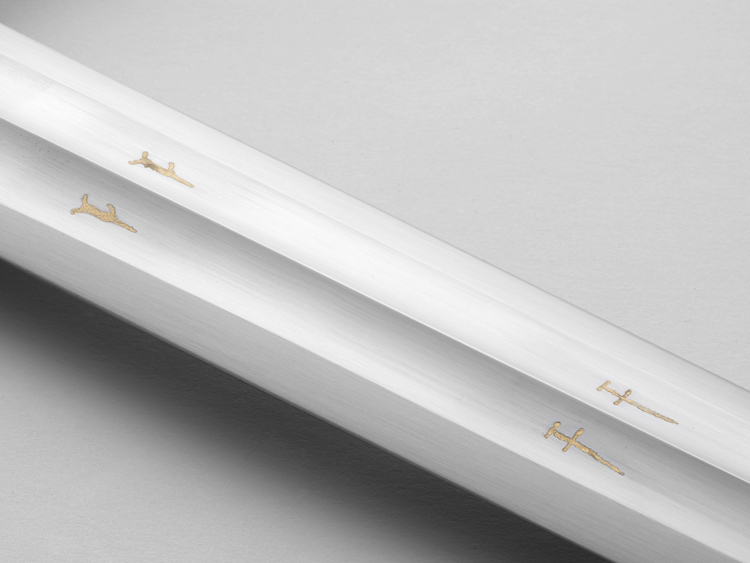 I like the inlay on the recreation, will it be present on the swords for sale or is it special for the museum? Yes, we will be doing the inlay on the Museum Line versions as well. We will be trying some other techniques to achieve that, for this and other swords in development. But it's amazing to see a wonderful replica of such an amazing sword. Can't wait for the next Wednesday when the exhibition opens, this replica with the original side by side should be a real treat! Awesome! Something to pull my attentions away from the Cluny sword. For me the Cluny has a nicer grip but this has a more interesting blade. Hmm, perhaps they will find an original sword, which featured a bit of both! Anyways well done Albion! I really am impressed by the Museum line and for me is what sets Albion apart. 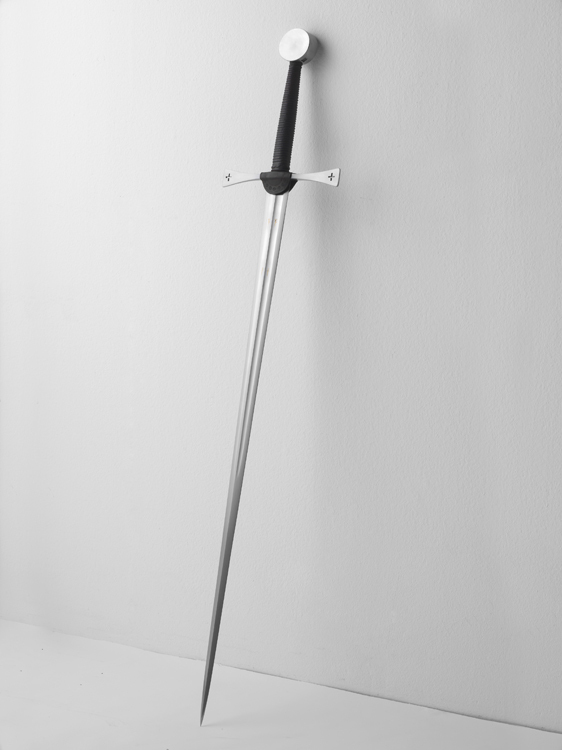 It is exiting to see the Ljubljana sword recreated as a Museum Line sword. Eric and Joe has done an outstanding job bringing this sword back to life. Søren was contacted by Tomaz Lazar of the National Museum of Slovenia during the planning stages of their exhibiton on chivalry: The Knight, the Lady and the Dragon. The task was to make a close replica of one of the swords in their collection to show the splendor of the medieval sword as it would have been when new. The situation was favorable, since there was an exhibition from the National Museum of Slovenia on loan to the Army Museum in Stockholm, with finds from the River Ljubljanica. The conditions for preservation in this river are very good: there is an incredible amount of finds of swords in great condition from the bronze age and onwards. In January this year the exhibit was ended and the objects removed from their displays. I was allowed an opportunity to document several highly interesting swords during two whole days, as the items were carefully packed away for transport back home to Slovenia. The crew from the museum was very professional, efficient and friendly. I could focus completely on documentation and there were always someone with specialized knowledge about the finds, their origin, history, metallurgy and conservation at hand that could answer any questions. I am grateful for this opportunity to learn directly from the objects and professionals in the field. I only wish there had been time to study more of the pieces, but I could make good use of the time available and came away with half a dozen swords documented. The n4516 was the main focus of study, of course. I was curious to learn from direct impression what this sword was like. It is one of those really good ones. You can tell it was made by some of the best craftsmen of its day. There is an economy in form and expression that does not take away anything of its power of presence. Rather it makes its character come out even stronger. The shape is stark and graceful with something very essential about it. It is close to the ideal idea of what a sword of this kind should be. With the drawing of the n4516 rolled up under my arm I was eager to come home to see if a geometric structure may have been the basis for its proportions. Not all swords have clear geometric ratios for their proportions. There will be an article with my analysis of the proportions of the n4516 published on the website of the National Museum of Slovenia when the exhibition has opened. After this I can show and discuss some of the details and ideas behind it here at myArmoury. Wow, Peter. Thanks for taking the time to write that post. Very informative. Is there a projected date for the opening of the exhibition? I'm curious as to what is in your article that gets released with the opening. That is a beautiful sword! I had no idea Slovenia had stuff like this lying around. I spent a year in Ljublana and married a Slovene girl, and somehow I missed it. Next time we visit her parents, I will have to stop by and visit the museum. Adam, the exhibit is on for a year and opened yesterday, so maybe you will be able to visit in time to see the Albion reconstruction side by side with the original? Personally, I really would like to go. I have friends who have visited Slovenia and have been told it is beautiful. Very impressive sword and I really like the double fullers: These where not obviously double fullers in the previous pics and the angled pic showing the thinning of the guard towards the ends makes it look very " mass efficient " i.e. robust by no extra thickness where it isn't needed. Just from looks alone I'm guessing a very fast and agile sword and a very good addition to the Albion Museum line. Yes, this sword is agile and manoeuvrable, but also a pretty hefty and powerful weapon. It is interesting to compare it to the Cluny sword, for example. Both can be classified as XVa swords even if the Ljubljana is not the most clear example of the type. The Cluny is longer in the blade but a much lighter sword. Even if both weapons are made for thrusting, the Ljubljana has a heft that makes it effective also in blows. The Ljubljana has the feel of a serious sword of war: an aggressive weapon made for the battle field. The Cluny longsword has perhaps more of a civilian feel to it (even if weapons like this are depicted in artwork with military saints and men at arms). It handles almost like a rapier made for one and a half hand usage, if such an animal can be imagined. 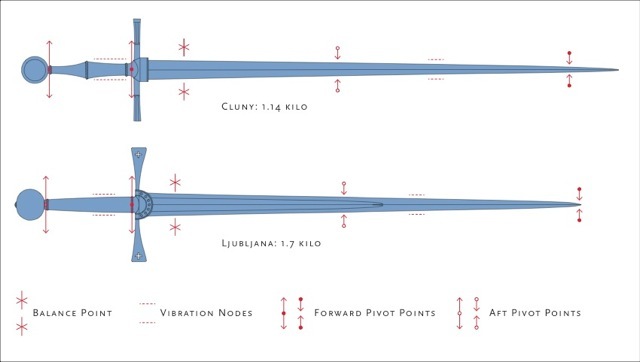 Illustration below show both swords to the same scale, with dynamic properties marked out. I am really interested to see how Albion handles the inlay on the Museum Line swords. I am fascinated by inlay and my recent collecting efforts have been on swords with inlay. The inlay is made by first etching and then gilding. On close inspection you may detect difference to the look of solid wire inlay: the gilding is not exposed on the surface level of the blade, but put ever so slightly sunken below. This is a difference to wire inlay that is flush with the surface, but this also protects the gilding. The benefit with this method is that it is possible to get very close to the precise form of the original markings *every time* and that it can be done on blades manufactured by milling and grinding. I have made drawings of the markings on the original blade and taken care to reproduce them in detail and exact scale. I think this method of etching and gilding it is a very good substitute to wire inlay. Having the marks of the original in the blade like this elevates the whole weapon. A touch of color and that deeper meaning that signs and symbols bring. -It is something w shall explore further in coming projects. Yesterday 12. 12. 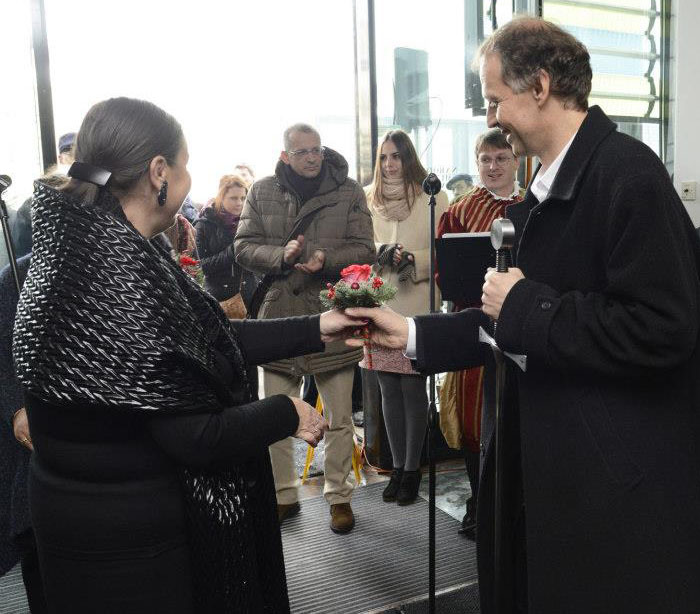 2012 at 12 o'clock (and at -12 degrees C) was the opening of exhibition Vitez, Dama in Zmaj (Knight, Lady and the Dragon) in National Museum of Slovenia in Ljubljana. I'm posting some photos here since the Albion's sword "Ljubljana" was one of the highlights of the opening. 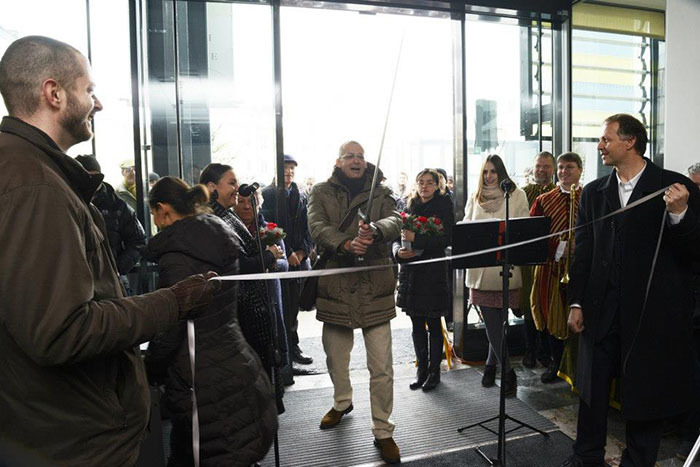 Authors of the exhibition, Tomaz Lazar on left and Tomaz Nabergoj on the right holding the ribbon, and Peter Stih (their superior in Museum hierarchy, I presume) "cutting" the ribbon at the opening. Not really cutting, since the Museum copy of "Ljubljana" isn't sharp, for safety reasons. Lobby of the new building of National Museum was waaay to small for all the visitors, even though it was at very inconvenient hour (most people have to be at work at 12 on Wednesday ). 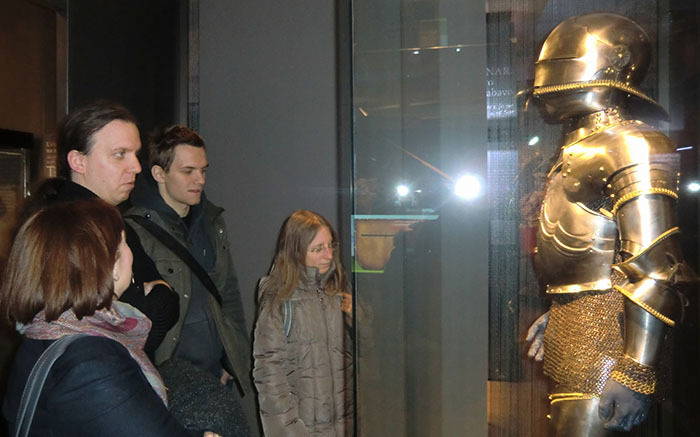 Members of our re-enactment group considering theft of "A 79" armour, loan from Austria, Kunsthistorisches Museum, armour of Emperor Maximillian I. by Lorenz Helmschmied. Sorry for less than optimal pictures, they aren't mine (1 and 3 posted by National Museum of Slovenia). I didn't have the opportunity to handle the sword, authors of exhibition were too busy for the whole time. The exhibition isn't completely finished yet, but it will be in a couple of days. Can't wait to spend a bit more time in there. That's an amazing sword and a great addition to Albion's Museum line. If I recall right, the blade on the original is a full 1CM thick close the cross. It must be very stiff. A real 'dragon slayer'. Thank you so much Peter for the illustration of the pivot points. I would almost kill to have such a graph showing such info for all of Albions offerings. I find it interesting that the FPP on the Cluny is a bit behind the point while that of the Ljubjana is right at the point. Perhaps the lighter blade of the Cluny does not need such precise placement of the FPP to maintain excellent tip control? I am curious, does it take multiple etchings to get the marks deep enough or are you able to get it all in one go?